John's Cameo Corner, Part II | Skinner Inc. Welcome back to John’s Cameo Corner! The March 22nd Fine Jewelry auction features several cameos and intaglios worth noting, in various mediums. 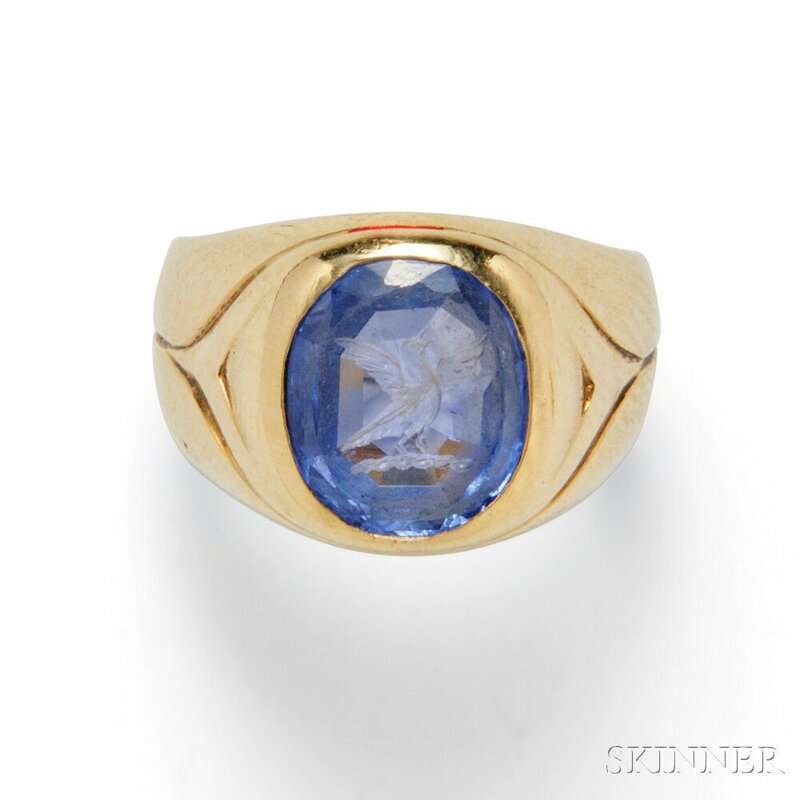 Carved gemstones are rare and desirable, and Skinner is pleased to have two such lots in our upcoming March sale. My personal favorite in this auction is Lot 298, which is an antique amethyst intaglio. The quality of the carving here is particularly fine as seen in the incredible detail of the hair and beard. Such carved gems have been highly prized since antiquity, and we’re fortunate enough to have a sapphire intaglio as well, Lot 321. Depicting a bird with outstretched wings, the intaglio is set in a 1940’s gold mount and was retailed by Spaulding & Co. of Chicago. Spaulding & Co. was known for retailing very fine precious jewelry, watches, and silver. Cameos are all about quality and detail, and Lot 344 includes a cameo of Athena with a wonderfully rendered helmet depicting a gorgon, with flowing curls protruding from below. Another fine cameo, Lot 324, is an example that is fully appreciated up close. Details are evident when worn, but once you look closer you can see all of the carver’s effort to make this a work of art. The headdress and curls are finely detailed, and you can differentiate her hair from the fabric of her hair ornament. The elegant lady is also wearing a hoop earring and pearl necklace. Cameos and intaglios are often associated with antique jewelry, but Lot 2 is a fine modern pendant/brooch by jewelry designer Elizabeth Locke. The hammered gold mount centers a glass intaglio depicting a scene of Mars and Venus, Venus sensuously reclining on the couch of Vulcan. Elizabeth Locke travels the world collecting such unique elements for her jewelry; ancient coins (Lot 1), antique Chinese mother-of-pearl gambling counters (Lot 3), and glass intaglios made from 17th century molds. Often set in hammered gold mounts, Locke’s jewels use antique materials for modern fine jewelry. 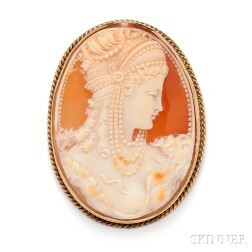 And finally, a bit of fun, the shell cameo (Lot 303) depicting an elaborately dressed Cleopatra is among my personal favorite lots in the sale. This carver used imagination to create this look- her hair is wild and she’s wearing an over-the-top headdress designed as a diadem suspending swags of pearls. How can we tell this is Cleopatra? The carver included the detail of an asp on her breast, referencing the scene famously depicted in Shakespeare’s Anthony and Cleopatra. Please join us at the previews for our March Fine Jewelry auction, and you can see which carved jewel is your favorite. Previews take place on March 20, from 12PM-5PM, and on March 21, from 12PM-7PM. This entry was posted in Blog and tagged antique amethyst, antique coins, antique jewelry, boston, cameo, carved gemstones, Elizabeth Locke, fine jewelry, jewelry, jewelry auction, mother-of-pearl, shell cameo, skinner, skinner auctions by John Colasacco. Bookmark the permalink.